Asoke is the best our vineyard has to offer. It is the first and only Thai Cabernet Sauvignon produced in Thailand. The Cabernet Sauvignon for this wine is from our French clone blocks. The grapes were left to ripen to their maximum and later hand-harvested in the cool mornings of March at 22-25°Brix, hand sorted and traditionally-fermented in open tanks. The Syrah selected for the blend was late-picked from our best Syrah block on a slope with red clay and good drainage. It was aged for fourteen months in new French and American oak barrels for robustness and balance. With a small percentage of Syrah in the blend to fill the middle palate, it is a full-bodied yet fruit-driven wine with a well-balanced oak. This wine is shows layers of red berries, bell peppers, plums, vanilla and spices. Complex and dry with exceptional marriage between the two grape varieties. The mouth feel is of red fruit, tobacco and elegant tannins. Held together by tight acidity that helps this wine to age well. 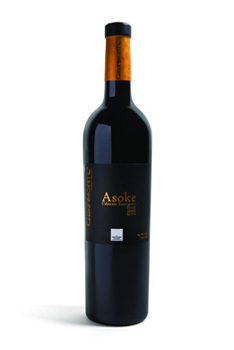 The well-structured tannins make this wine pleasurable drinking on its own or with food. This wine is crafted to be enjoyed with a few years of cellaring and will improve with age. Drink now – 2025.